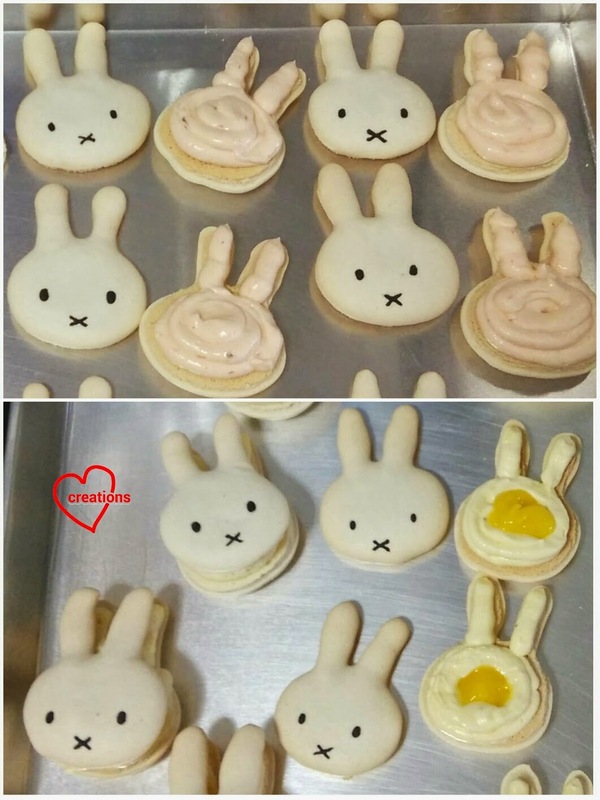 I had a request for Miffy macarons from my friend the same week as the assorted Peppa pig and friends macarons. So I made them together in one single session! Here's Miffy along with Rilakkuma! Pardon my poor photography skills. I took many photos of the various macarons (Peppa pig and friends, Garfield, My Melody and this set) in a hurry and this set didn't turn out too well. 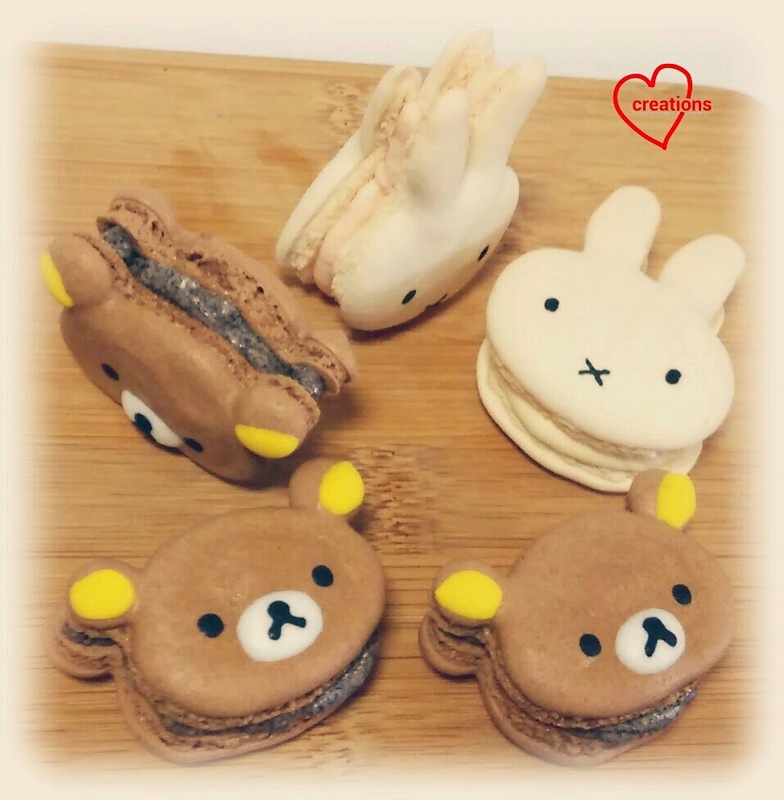 Recipe for Miffy macarons is the same as my panda macarons. 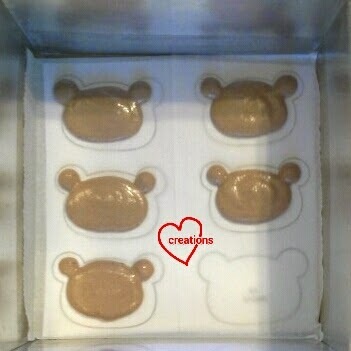 Recipe for Rilakkuma is the same as my Mickey and Minnie macarons except that I omitted the charcoal powder. Freshly baked and paired shells! Freshly iced along with Garfield and My Melody. This is only half the batch I made! There were still another 21 Peppa Pig and friends macarons! Filling up half of Miffy with strawberry swiss meringue buttercream and half with lemon curd and lemon smbc. 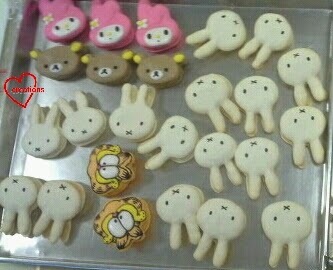 Filling up Rilakkuma with cookies n cream smbc. Glad that the Miffy macarons were well received! My kids got to eat the Rilakkumas and as usual they were happy to eat any leftover macarons! You may think that I am very good at piping weird shaped macarons. Actually I am still learning and still making mistakes! But with every practice, I learn something new :). Love this! Just wondering how did you get Miffy's facial features on the shell? Was it done before or after baking? Thanks! 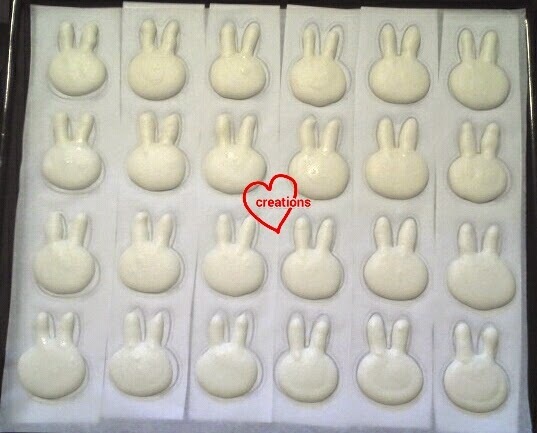 I drew Miffy's features on after baking the shells. I used charcoal coloured royal icing and a toothpick. It's rather tedious so if you happen to have edible marker that would work too :). Just be careful not to smudge it.